Know The System is an educational organization dedicated to elevating public understanding of national challenges, to take democracy in the United States to the next level. An informed citizenry is essential to a well-functioning democracy. We all assume that the “fourth estate” is what engenders citizens’ understanding of our national situation. In the last three decades, unfortunately, the quality of news has degenerated, raising questions about what the news can realistically be expected to accomplish. In Informing the News, Thomas Patterson has described, in some detail, the changes that have been taking place. News has taken on a more “theatrical” style. Journalists in an attention economy prioritize novelty, and conflict. Electoral competition is the lens through which everything is interpreted. As cable spread into American homes in the 1980s and 1990s, the audience for broadcast news and newspapers declined. As the losses mounted, a theatrical style of news emerged that was designed to compete with cable entertainment. Critics called it “infotainment” and “news lite.” …Whatever the justification, the news today is less substantial than it was during the broadcast era. Reporters needed an expedient alternative and by the late 1970s had devised it. When a politician said or did something newsworthy, journalists reached out to an opponent to attack it. The critical element was supplied not by careful investigation of whether a proposal was sound or sincere, but by seeking out an opponent who would rip it apart. “You go shopping” is how Los Angeles Times reporter Jack Nelson described the practice. It was as ingenious in its safety as in its simplicity. It allowed the journalist to orchestrate the attack while staying out of the line of fire— politicians would do the dirty work of tearing each other down. “He said, she said” reporting was abetted by a change in the style of journalism. …By the early 1990s, journalists no longer had to “go shopping” to find their assailants. The bipartisanship of the postwar era had faded, and a new breed of politician, less given to compromise, was emerging. To be sure, newsmakers are the ones doing the attacking. But journalists are the ones who decide which statements will make it into the news. A study of candidates’ stump speeches found that journalists largely ignore the candidates’ policy statements, which account for most of what they say, choosing instead to report the moments when they go on the attack. Meanwhile, in our era of manufactured consent and of nonstop campaigning, all public statements by politicians are carefully orchestrated to gain power rather than to inform or explain. Most politicians are not themselves experts in communication strategy, but their media advisers are. They have taught politicians the importance of staying on message, no matter how simplistic it sounds or how misleading it may be. “The cure for propaganda is more propaganda” is how Edward Bernays, the founder of modern public relations, described the tactic. …Politicians have also been trained to find and exploit their opponents’ weak spots. “Find the wart; make the wart stand for the whole” is how one analyst put it. Politicians have also been taught that every issue is part of the larger competition for power. “The line between campaigning and governing has all but disappeared,” Thomas Mann and Norman Ornstein write. Political coverage, says NYU’s Jay Rosen, allows journalists to “display their savviness, which is [their] unofficial religion.” Moreover, reporters spend much of their time tracking political leaders, which naturally leads them to find significance in what they do. “Reporters like to concentrate on … tactics and devices,” journalist Tom Wicker wrote. “In their usual footrace or game perspective on politics, they and their editors see these as being more critical than … most issues.” Twitter and other Web-based communication have heightened the tendency. Our misinformation owes partly to psychological factors, including our tendency to see the world in ways that suit our desires. Such factors, however, can explain only the misinformation that has always been with us. The sharp rise in misinformation in recent years has a different source: our media. “They are making us dumb,” says one observer. It’s worse than that. They are also making us wary. When fact bends to fiction, the predictable result is political distrust and polarization. The distortions of media also have pernicious effects on policy. As an example, Patterson describes how the increasing focus on crime in the news led Americans to believe crime was getting worse, despite statistics that showed it is getting better. When people are misinformed, … their mental shortcuts send them to the wrong place. Americans who believed that crime was rising sharply had a reason to want more prisons and longer sentences. The problem was not their deductive logic. The problem was their premise. They believed crime in America to be something it was not. Such is the state of the news today. …Contextual inadequacies help explain a research finding that initially puzzled scholars: the fact that people don’t learn much from news stories unless they already know something about the topic. 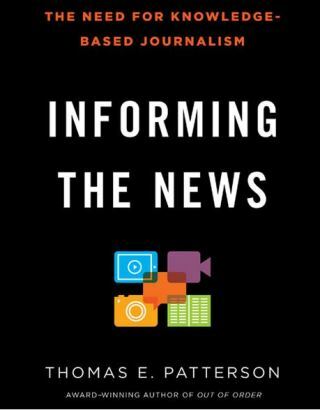 Scholars had assumed that poorly informed individuals would learn the most from exposure to a news story because they know the least. Yet they don’t. The uninformed often don’t know enough about the topic to make up for the scarcity of contextual information. As a solution, or at least as a counterweight, Patterson’s proposal is what he calls “knowledge-based journalism,” rooted in improvements to college journalism programs. Education for aspiring journalists should not only be about the reporting process, but also about subject matter: journalism students should take a significant amount of coursework in an area of specialization such as economics or public policy. The proposal has great and obvious merit, and it could certainly make journalists more capable of providing context in the news articles they will later write. There are grounds for doubt, however, that the aforementioned developments of recent decades will permit a greater amount of context to be inserted. And if it were inserted, it may be questioned whether much of the market will read it. Political scientist Michael Robinson questions whether many readers care about seriousness or hard-nosed reporting, and comments, “My honest assessment is that the press actually does a better job than the market requires.” A thin market segment consumes long-form journalism, but the vast majority of people consume news only for its entertainment value, an opportunity to keep up with the latest excitement. Better reporting is helpful, but it is clear that the fundamental problem is less about journalists’ knowledge and more about citizens’ knowledge. People will not learn much from news stories unless they already have some knowledge about the topic at hand. It is not immediately obvious how or whether such knowledge can be acquired by them. Certainly much of the challenge is enticing citizens into allocating a bit of their attention, giving them confidence about what they’re going to get, and making the learning efficient and enjoyable. Well-designed multimedia would be likely be more effective than text. I have outlined other requirements elsewhere. A great prize is discernible: if citizens had basic knowledge about issues, and if journalists worked harder to provide context in news stories, a new, elevated level of public discourse could then emerge. It might not slow the larger media trends of recent decades, driven as they are by unyielding commercial pressures. But it might increase the demand for serious, substantive news, and could even generate the popular will to support legislative problem-solving. 1 Pings/Trackbacks for "Democracy and the Deterioration of Journalism"
Support Know The System with a pledge today, for bi-partisan mutual gain!